“Old Faithful”, the jacket that has accompanied me on more shoots than any other single piece of “gear”. 1/200 sec., f/2.8, ISO 100, 35mm. THE ONE PIECE OF “EQUIPMENT” THAT HAS SEEN ME THROUGH THE TRANSITION FROM FILM TO DIGITAL is not a hunk of techno gear. In fact, it has not directly figured in the taking of even a single picture. I was reminded of its amazing longevity a few months ago, as I was going through a 2002 shoot done in Ireland. Among my own shots was a pretty good candid of me, taken by my wife, as I crouched to line up a shot next to a road heading to the Ring of Kerry. And there “it” was with me. In fact, it was keeping me warm and dry. Context: I never took the plunge of the eager amateur and purchased one of those puffy, sleeveless photog vests, honeycombed with a zillion pockets, pouches and secret compartments, much as I never painted the words CAMERA NERD on my face in day-glo orange. Chalk it up to self-consciousness. I figured it was hard enough to blend in and keep people relaxed in a shooting situation without looking like a cross between a spinster butterfly hunter and a middle-school lab assistant. Call me vain. 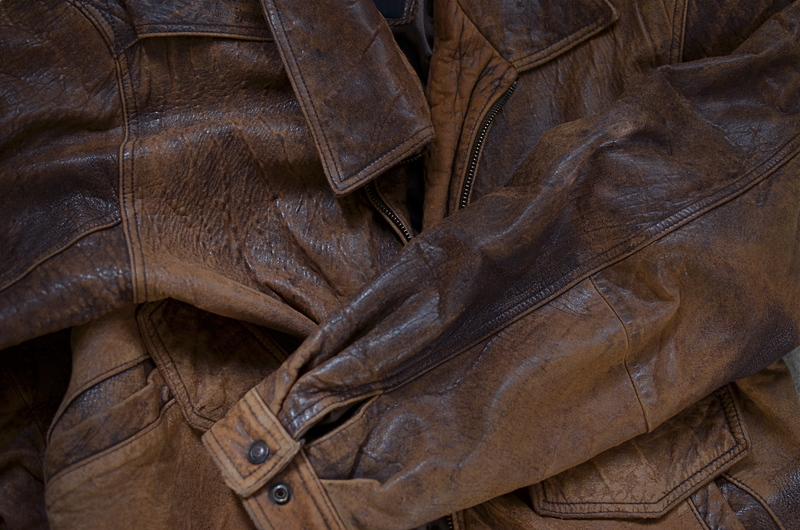 So, a plain brown leather jacket. Gimme three good pockets and call it day. And thus it was that, for the next thirteen years or so, I have had “skin in the game”, skin that has survived exploded pens, leaked batteries, rotten weather on two sides of the Atlantic, and more scrapes, tears, and rips than I care to recall. It has also helped keep countless camera straps from inscribing a permanent groove in my left shoulder, and, here in the Land Of Incipient Arthritis, I appreciate that more than I can say. Such service calls for a little respect, and so, in the name of the weirdest still lifes ever, I figured it was time for Old Faithful to pose for a portrait of its own. Originally I thought to lay it out straight, the way they show off famous duds at the Smithsonian. But what really caught my eye was that, texture-wise, it is almost six different jackets, from the glossy sheen of an old horse saddle to the frayed look of something that’s been making out with a cheese grater. At the last, I simply experimented with a few crumpled waves of grain, as if the jacket had been hastily tossed aside, which, trust me, it has been, on countless occasions. Best thing is, when I’m ready, it’s still there. I’m not a big fan of good luck charms, but maybe some things protect against bad luck, and that’s no easy feat, either. Either way, me and what Kipling would have called my “Lazarushian leather” and I will keep signing up new missions. At least until one of our arms fall off. This entry was posted on January 26, 2013 by Michael Perkins. It was filed under cameras, Composition, Framing, Nostalgia, Still Life, Textures and was tagged with Equipment, Gear, Ireland, Leather jacket, Memoir.